Smile is one of the most precious gift we can give to someone . 1.Spending quality time with near and dear ones. 2.Gifting some useful and unique gifts to others. 4.Cracking some good Jokes . 5.Preparing favourite snacks and dishes for our near and dear ones . I have small kids who love to eat delicious snacks prepared at home . If its something they love , a big Smile comes to their face . Similarly in evening and on holidays again they expect something special like some Delicious snacks of McCains . I have brought McCains Snacks like french fries , McCains Crispy Happy Potato several times . They like it a lot specially McCains Crispy Happy Potato because of its smile shape . It looks good and also tastes good. 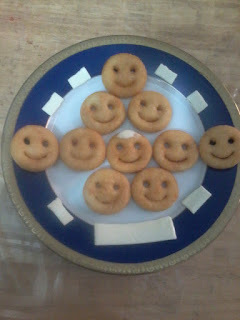 McCains smiles potato are mashed potato formed into happy faces. Its crispy from outside and soft from inside . A form of Indian Aloo Tikki but having an awesome taste. Contains carbohydrate , protein . Does not contain any Cholesterol , so good for people who avoid cholesterol rich food. Its an excellent snack which is fulfilling . One can add various toppings to make it more delicious . Like topping of Cheese spread , tomato ketchup or sweet and sour tamarind chutney . One can do topping depending on one’s taste to make it look more appealing and delicious . Since it contains carbohydrate , a good source of energy for growing children . Ideal for lunch box as we often worry what to give in lunch box . As many kids are bit choosy and do not eat everything happily given in lunch box , so its a challenge for moms to give some good and healthy snacks which their kids would eat happily. I also try various healthy snacks for my kids lunch box , Mccains Happy Potato is one of them as I know they just love it and would eat it without any fuss. The best part is a Big Smile on their face . So its a matter of health and happiness . Since it is a type of frozen food , one can easily store it in freezer for a long time . One has to just check the expiry date before frying . To cook one needs to keep it outside for some time and then it should be fried in oil turning both sides till crispy and brown . Sometimes when we are too busy we do not get sufficient time to prepare snacks for our kids and family , we can use McCains snacks that time .It becomes easier for us to prepare delicious healthy snack in less time. Some times when unexpected guest arrive to give us a Surprise , the first thing that comes to my mind is ” What to serve ?” and I start thinking about snacks available at home .If McCains is there in my freezer then I feel relaxed as I can prepare a delicious snacks within few minutes and bring a smile to every ones face . On special occasions like Festive Time or Kids Birthday parties or Celebration Time when my kids get excellent results in exams I do try to Prepare McCains Smile to bring a Smile on their face . That makes me happy and satisfied that my kids love what I do for them. So try McCains to bring to smile to other’s face .